I’m a peanut- and almond-butter freak. Both are great on apples and English muffins, but they haven’t been so portable—until now. 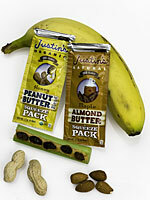 Justin’s Nut Butter got the smart idea to put nut butters in 100-calorie packets. They come in great flavors and are perfect for hikes, car trips, and flights.